Here's question from Kojo A.
I have a building in Ghana, West Africa currently under construction. I would like it to have a hip roof, and am having problems designing the roof for it. I was searching on the net and came across your website, which has been quite helpful. I am running into a few trouble areas on my roof and can't seem to figure out what the problem is. 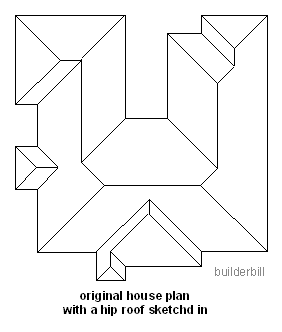 I would be more than happy to send you a copy of my roof plan if you would be willing to help. Thanks. After a couple of emails I had some plans to look at. Please note that in cases like this I am only giving my own personal opinion for what it is worth. I am not a qualified architect and wouldn't want to be. 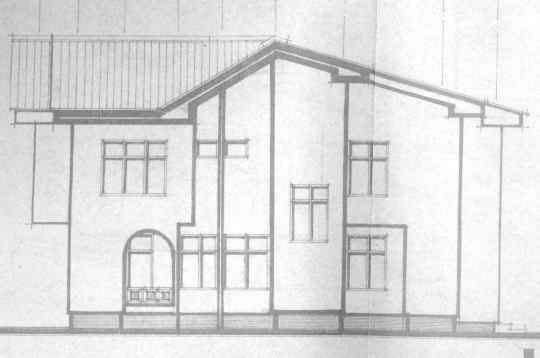 Complex Hip Roof - Here's is a reproduction of one of the elevation of the proposed house. As a general rule I don't mind gable ends, gable roofs are very quick and easy to build. I am not to keen on the appearance of this elevation though. To my mind it looks unbalanced and a bit complicated. Again I don't mind seeing a house using different pitched roof surfaces, but they have to be part of the overall idea. A real feature. 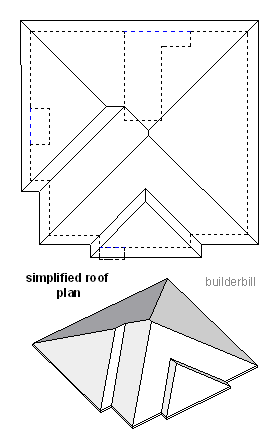 Complex Hip Roof - The proposed roof plan. The house is being built in the tropics and gable roofs do not shade the gable walls so they do not provide the all round shade that hipped roofs with their level eaves do. (In Australia where I live it is mandatory to provide shade to all windows and doors for energy conservation reasons). So in this instance a hip roof would provide shade for all the upper floor windows. Buildings with right angle corners make for parallel walls, and this makes it fairly simple to design the roofs for them. Because this plan has no odd angles I can safely go ahead and draw a standard hip roof on it. Standard hip roofs have the same roof pitch or angle to ever roof surface. To achieve this the ridge to any section is set mid way between opposite walls. With the ridges on the center lines between walls, the hips and the valleys are at 45 degrees on plan. (they bisect the 90deg. corners). All this is basic stuff but it does no harm to remind ourselves when drawing a roof with so many corners as the one shown here. 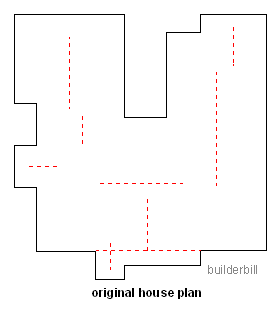 I draw the top floor plan to scale and then as an aide to helping me to work out the roof I sketch in construction lines (dotted red) that could be ridge positions. Any building can have this sort of simple sketch applied to it to analyze the way it s going to look. Architects and designers love doing these odd shapes to provide visual effects. This sketch is just the house area covered and we have to allow for the overhang at the eaves yet, which in this case I think Kojo is going to use 3ft. Even now without the overhangs the plan looks scrappy to me, and it will not be really cost effective in time and materials to build it. I can't see the point in the indentation between the bedrooms continuing up to the roof. (On the top of the plan as you see it.) It is certainly a good feature in the walls, because it provides for more windows which in turn mean more cross ventilation in a tropical climate, but the roof continuing over would be far easier to build and shade the windows also. 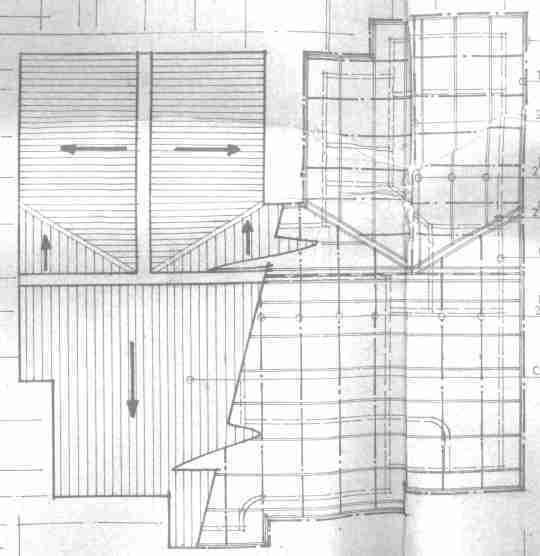 I have also continued this simplification to the other cut out on the left and I have not drawn the roof over the small projection at the bottom of the plan which is an open patio and I am saying that the roof overhang should be sufficient there. So that means using beams across the open sections to carry the rafters. I can't recall using timber beams for jobs like this since pre-cyclone Tracy days. We always use steel. Another option for Kojo would be to form and pour concrete beams. From the drawings that he sent me I know that she is building out of hollow concrete blocks, so he could use those. The house makes use of arches, so maybe they could be used also with the new beams. There is always a trade off between looks and cost and I am not saying that this is the only way to build a roof like this. One basic thing that I always do when starting to work out a plan is to work on it as a whole. That is I think about the roof implications while I am drawing the wall plans. A small indentation in a wall can have a huge effect on the cost or the looks of a roof. It is a gradual process and at first sight what looked like a fairly complex hip roof can be made quite easy really.